Eat for Health was created by Joel Fuhrman, M.D who is one of the leading experts on nutrition and natural healing and acclaimed author of Eat to Live. His program is designed for people who want to achieve superior health, maintain effective weight control and reverse and prevent disease. Fuhrman says that while weight loss is important, it is not the major focus of his program, but rather a by-product of the main goal, which is superior health. By applying the principles that will create excellent health you will naturally achieve your ideal weight. He states that the power of his program is that you are given the knowledge so you will ‘become a nutritional expert’. Eat for Health will allow you to create long term success because it teaches you how to form new healthy behaviors that will let you take control of your own health destiny. The central idea of the program is based on increasing the nutrient density of the diet. Fuhrman says that most people don’t get enough vitamins and minerals in their daily diet and that this is the cause of food cravings and overeating. It also makes them more susceptible to the serious diseases that are reaching epidemic proportions in Western societies. Eat for Health involves a four phase eating plan that allows you to adjust to the diet gradually. Each phase progressively includes a greater intake of high nutrient density foods and contains a meal plan with recipes. The program is designed so that you can make smaller changes first rather than demanding that you start immediately with a strict plan, which is common in many other diets. You can remain in any phase as long as you like and by slowly adjusting your diet this allows you to lose your psychological dependence on unhealthy foods. As you replace unhealthy foods with high nutrient density foods you will reset your internal taste preferences and hunger drive. Fuhrman claims that once this occurs you will be amazed at how it becomes easy to lose weight without dieting. The program includes exercises with food that will help you to learn to prefer healthy eating by strengthening your digestive system, providing new taste sensations and allowing you to lose weight effortlessly. Fruit and vegetables form the foundation of the plan because they are the foods with the highest nutrient density. In particular green vegetables are emphasized because these are the foods that generally have the most nutrients. Fuhrman advises dieters to regard the salad as the main dish and encourages the intake of green juices, blended green smoothies, steamed vegetables and soups. Other recommended foods include legumes, whole grains, tofu, nuts and seeds, avocado. Animal products including eggs, low fat dairy, fish, chicken, and meat are to be limited ideally to two servings weekly. Search here for other healthy meal ideas. Fuhrman highlights the importance of exercise for weight management and cardiovascular health, however no specific guidelines are offered in the book. 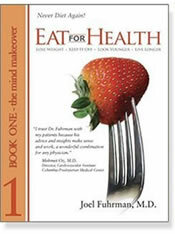 Eat for Health retails at $46.99 for the two book set. Encourages a high intake of fresh fruits and vegetables. Program is based on evaluation of over 20000 scientific studies. Focuses on education, which puts the power in the hands of the dieter. Allows for a gradual adjustment to a new eating style. Scientifically proven to reduce the risk of heart disease, cancer and diabetes. Concentrates on health as the major goal with weight loss as an advantageous side effect. Calorie restriction with a high nutrient intake may increase longevity. All recipes include nutritional information. May be expensive due to the requirement to purchase large amounts of fresh produce. Difficult to eat out and stay on the program. Some dieters may have difficulty adapting to the lower intakes of protein and fat. One of the major strengths of this program is the four-phase approach, which allows dieters to implement healthy changes in their diet at a comfortable pace. Fuhrman has attempted to make his program accessible to all dieters by providing encouragement, support and knowledge in a flexible format.